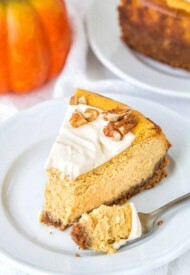 Irresistibly creamy pumpkin cheesecake, sweetened with maple syrup and smeared with maple pumpkin whipped cream frosting. It’s your next favorite fall dessert! My goodness, I have quite a treat for you today! Hope you’re not sick of everything pumpkin yet. 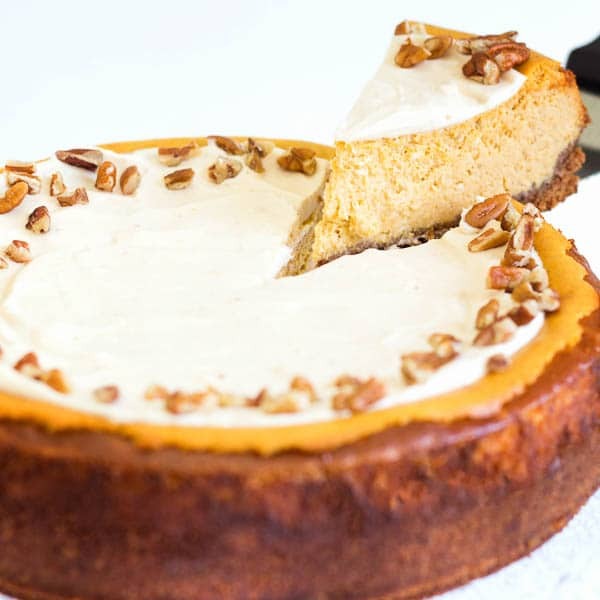 Because this maple pumpkin cheesecake needs to happen in your kitchen. Period! 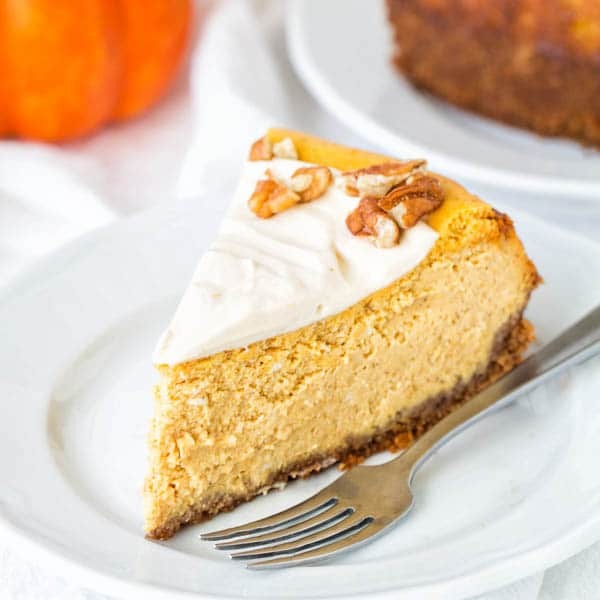 Adapted from my stunning carrot cheesecake, this pumpkin version is sweetened with maple syrup and topped with pumpkin maple whipped cream. The cheesecake filling is super creamy and soft. With generous amount of pure pumpkin puree, it has unmistakeable pumpkin flavor, enhanced with warm spices, like cinnamon and nutmeg (preferably freshly grated). And as if it lacks any more pumpkin, I’m topping it with more pumpkin-flavored whipped cream. If you’re going for a pumpkin treat, might as well go overboard with it, right? And let’s not forget about that beautiful crust! It’s nutty, buttery, sweet and cinnamon-y. Absolutely the best compliment to creamy cheesecake filling. 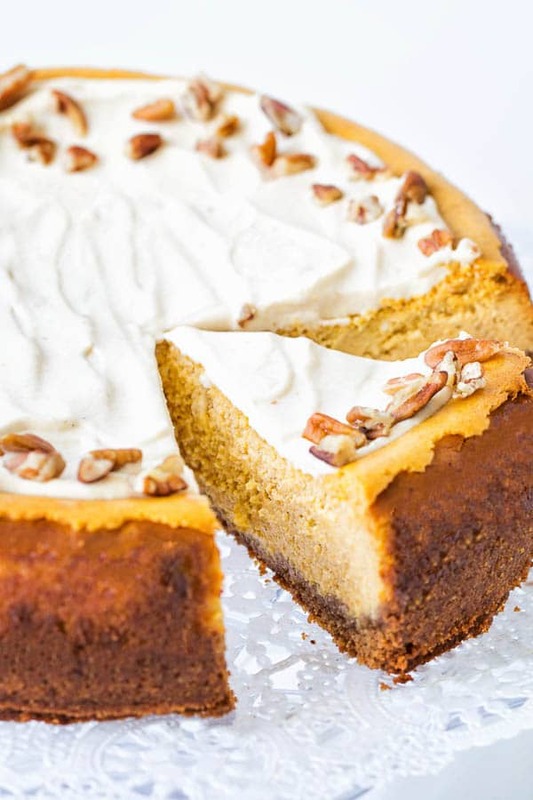 This is not just pumpkin cheesecake, my friend, this is MAPLE pumpkin cheesecake. So let’s take a moment to talk about maple syrup. We’re talking about 100% pure maple syrup. No maple-flavored, artificial crap syrup here! When shopping, read the labels carefully, as there are different grades of maple syrup out there. What you’re looking for is pure maple syrup, Grade A, Medium or Dark Amber. Rule of thumb, the darker the syrup, more robust maple flavor it has. That being said, ideally we want Grade B maple syrup for baking , but it’s more for commercial use. Grade A Medium or Dark Amber is the most common varieties, and it’s perfect to serve on the table with your pancakes and waffles. In my testing, I found maple syrup alone doesn’t add enough sweetness, so I used a combination of sugar and maple syrup. The cheesecake is sweet enough with slight caramelized maple hint. By now, you probably noticed that I like my cheesecakes nice and tall. Can’t get enough of the thick, creamy goodness! During cooling, the cheesecake might crack. Don’t sweat about it though, cuz we’ll smear a layer of fluffy whipped cream all over it. Besides, who is gonna complain about a small blemish, when it tastes like heaven! NO ONE!! Add this to your weekend to-bake list now! And let me know how it turned out for you. I’m looking forward to your feedback. 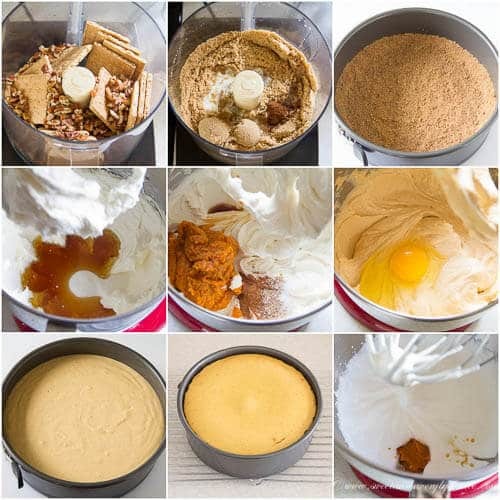 To make the crust, in a food processor, pulse the graham crackers and pecans until fine crumbs. Add brown sugar, cinnamon and melted butter and pulse until combined. Press the mixture evenly onto the bottom and slightly up the sides of an ungreased 9-inch spring form pan. Refrigerate while preparing the filling. To make the filling, in the large mixing bowl with paddle attachment, beat the cream cheese until fluffy on medium speed, about a minute. (Or you can also use electric hand mixer.) Add sugar and maple syrup and continue to beat for another minute. Stir in the pumpkin puree, vanilla extract, ground cinnamon, nutmeg and salt. Mix until well combined, about 1 minute, scraping the sides half way. Beat in the eggs one at a time and mix just until combined on low speed. (Don’t beat the mixture too long and too fast after you add the eggs. Otherwise too much air will incorporate to the batter, which might cause a crack in the cooked cheesecake.) Pour the batter into the prepared crust. To make the frosting beat the whipped cream in a mixing bowl with whisk attachment, until hard peaks form. Add pumpkin puree and maple syrup and mix until smooth. Once the cheesecake is completely cooled, remove springform sides of the pan. Spread the frosting evenly and serve. Refrigerate the cheesecake in airtight container for up to 3 days. Adapted from my Carrot Cheesecake. This recipe was originally published on October 14th, 2015.